The pale lime color of this authentic genuine peridot gemstone is paired with striking 14K white gold in this plain peridot cross necklace from Apples of Gold Jewelry. Measuring at 1 inch tall by 3/4 inch wide, this polished white gold cross pendant uses a prong setting to hold a pale green peridot gemstone in the center of the cross. The AA rated peridot gemstone measures 1.75mm in size, making it the perfect pendant to slide onto a chain and wear for special occasions or every day events. "For God hath not given us the spirit of fear; but of power, and of love, and of a sound mind. "(2 Timothy 1:7). 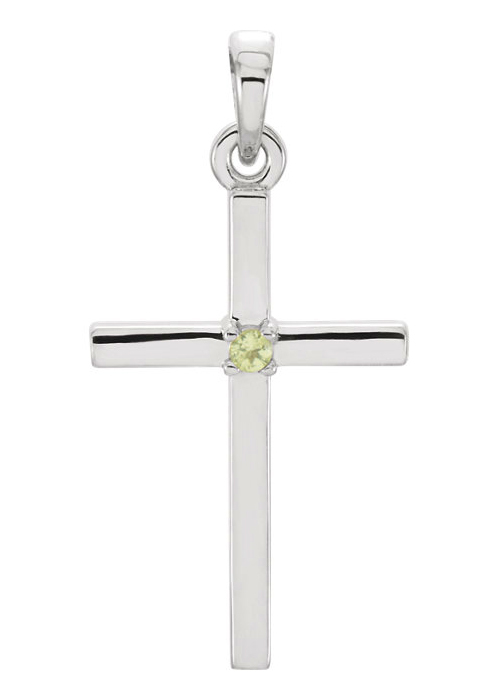 We guarantee our Plain Peridot Cross Necklace, 14K White Gold to be high quality, authentic jewelry, as described above.